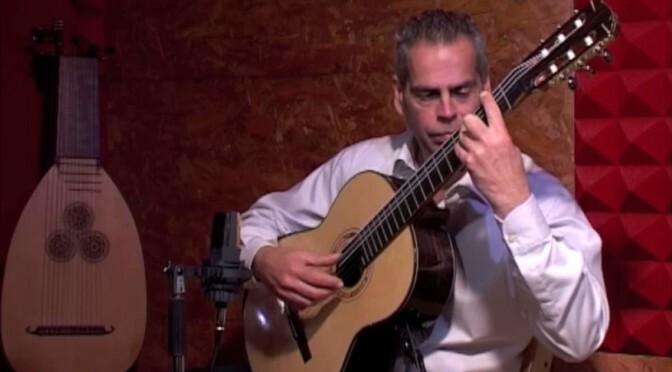 Italian classical guitarist Marco Salcito plays Johann Sebastian Bach’s Goldberg Variations, BWV 988, on classical guitar, in the original tone. It is originally a work written for harpsichord and published in 1781, consisting of an aria and a set of 30 variations. Salcito plays Aria, Canons (Canoni) and Aria da Capo in this home recording video (May 2015). It is a very clearly played, brilliant, a virtuoso performance. I especially like the tune of the guitar which is made by the master guitar builder Enzo Guido (Chioggia, Italy). The Variations are named after Johann Gottlieb Goldberg (before 14 March 1727 – 13 April 1756), the German virtuoso harpsichordist, organist, and composer of the late Baroque and early Classical period, who was probably the first performer of the work. After a statement of the aria, at the beginning of the piece, there are thirty variations, and again Aria da Capo, repeat of the aria at the beginning. This is a very original project since we can only find guitar duos and the works for solo guitar are overdubbed in more tracks of the work. Salcito’s version is completely different to the existent ones. The full album (2 CDs) is published under the label of Dynamic, and you can buy it by clicking here. Italian guitarist Marco Salcito, graduated with a maximum of the votes and the praise at the Conservatory “D’Annunzio” of Pescara under the guidance of Maestro L. Guerra. As fellow attended courses three-year high processing at the Accademia Musicale Chigiana of Siena obtaining two diplomas of merit. He graduated “guest” at the Musik Akademie der Stadt Basel in Konzert Klass of M° Oscar Ghiglia. The result was winner of the bonuses in important national and international competitions such as: the international competitions F. Sor in Rome (1st prize), M. Giuliani in Bari (2nd prize), R. Bartoli in Salon En Provence (2nd prize), International Competition of the School Civic in Milan (1st prize), G. Princes in Milan (1st prize), International Competition in Mottola (1st prize). Marco Salcito was guest of prestigious concert seasons as the Festival New Consonance of Rome, the establishment Abruzzese Symphony, Meisterkonzert, Stuttgart, Basel Stadt Casino, “Amici della Musica” of Cosenza etc. He has made concerts with various ensembles of chamber music as the quintet Italiamusica, the Quartetto chitarristico Italiano and the group Rosso Gitano collaborating with names of prominent panorama of Italian concert. In duo with the violinist Luca Ciarla, Marco Salcito performed in June 2006 in Hong Kong Academy at the Center of Performing with the Hong Kong Chamber Orchestra in an interesting program entitled “Cinema my love” in which they are presented a series of pieces belonging to the most famous soundtracks of Italian cinema with great success. After this success he was again asked in 2007 to perform at City Hall in Hong Kong as soloist and arranger of Romanze of F.P. Tosti with the city Orchestra obtaining broad support of public and critical. Marco Salcito has recorded, in the first execution, compositions of authors for the contemporary Italian music House Bongiovanni of Bologna and RAI trade. In 2007 he published his first CD with his compositions published by Violipiano by the title “Rosso Gitano”, and in 2009 the CD by the title “Scaramouche” with M° Gianluca Sulli. He performed soundtracks of film composed by L. Bakalov and E. Morricone for the Twentieth Century Fox and the RAI trade. In 2014 Dynamic label published a double CD of Goldberg Variations (BWV 988) by J.S. Bach for guitar solo. National winner for the Conservatory from 1994 Marco Salcito is the holder of the chair of guitar at the Conservatory “U. Giordano” in Foggia. He gives regularly seminars and courses of interpretation for his instrument to Vasto (CH) during the “Seminari Musicali Internazionali” and S. Giovanni Rotondo (FG) during the International Guitar Festival.